The return of the “Hornets Week…” blog post following a three week hiatus during which we finally were able to take one off due to the All-Star break (thus one of the weeks not being included in the counting of weeks process). With so much already covered and talked about, this column’s topics seem to be much more trivial. I suppose that we’ve reached the point of the season where the overall picture of the team is quite clear and the majority of the conversational points concern much more mundane day-to-day happenings of the team. Several points that I jotted down in my notes seemed to be exhausted and more suited for inclusion after the season ends (when I’ll probably have to do an extra-large piece and rate each player’s season). As of late, it seemed like Zeller had been missing every single one of his mid-range jumpers. 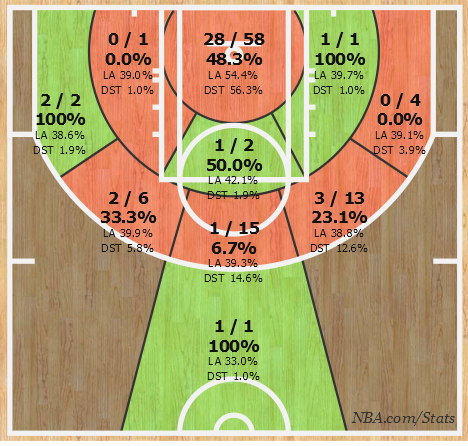 I decided to scoop around and take a look at his shot chart, sneakily setting its start date after that 8/8 FG Boston game (to be exact, I used January, the 8th, the game we played at Toronto which Cody sat out due to a shoulder strain). Turns out that he literally had almost been missing everything. Yikes. I badly wish to see him get back on track, but it’s starting to look like he’s hit an offensive slump reminiscent of last season (during which it was the other way around, with Cody having a poor start to the year and hitting his stride later on). 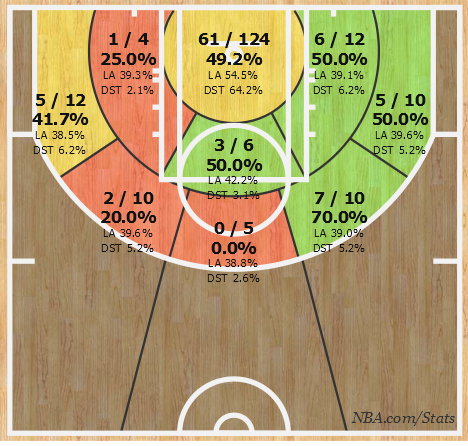 His defense has been great whole season long and it’s a shame that his bad shooting will most likely over-shadow an otherwise solid year. We were able to see some extended Jeff Taylor minutes due to a Michael Kidd-Gilchrist hamstring injury. Even if coach Clifford is committed to shortening the rotation to 9 players and we don’t see much of Taylor in the future, I would assume that over this particular period of time (during MKG’s time out) JT received the nod over P.J. Hairston because of his defense. He didn’t disappoint, at least in my eyes. The eye-test certainly approves Taylor as a positive on defense, even if his body of work (moreso on offense though) was mostly shaky last season. The general numbers weren’t kind to him as he recorded a defensive rating of 108.0 during these two weeks (alongside an offensive rating of 88.6). I’ll maintain my stance though that judging by what you see on the court he was pretty decent. First off, his most frequent line-up, him alongside the starters (Roberts/Hendo/Zeller/Al), recorded a rating of 116.0 – 89.8 in 28 minutes. Much more random and goofy combinations of five players have seemingly hurt his cause much more than anything else. Second off, judging defense by numbers is still not completely possible in this day and age. I was reminded of this after reading a fantastic piece of research for the Sloan Sports Conference by a team that featured Grantland’s Kirk Goldsberry. It contained seemingly indisputable logic in the way they created a measurement on defensive value. Yet it has Michael Kidd-Gilchrist as the second worst wing defender of the 2013-14 season, something that I’m sure we would all argue with. Who knows.. If he had been on any other team’s roster, he might have been cut by October (following his domestic abuse incident) and be playing in China as of now. Deserving or not, he’s still in the league. If I were him, I’d wait for any opportunity of playing time that might be present itself and demonstrate my best 3&D wing player impression. That’s the one thing that can keep him in the NBA. It’s something I’ve previously touched on, but it seemingly requires a repeated mention after a truly bad two weeks. These two don’t work as a combination at securing the defensive glass. They won’t be able to get a key rebound to save their lives. While line-ups that feature Maxiell and Williams have rebounded 74.2% of defensive rebound opportunities for the whole season (good for the 17th best mark), that number has been at 68.7% during the last two weeks which would be the league’s worst (coincidentally they have given up 110 points per 100 possessions over that same stint). Cleaning up our own glass is a staple of our defense and without it we can put up a truly bad stretch of defense. Please oh please, I want to see Bismack back on the court. Watching Mitch McGary and Enes Kanter repeatedly grab rebounds in our paint was hard to watch. He’s been 1 for 17 during the last six games and three quarters ever since that hot streak. Hilariously enough, Stephenson went 1 for 18 before those three made threes. Just a perfect example of the erratic play he’s shown in a Charlotte Hornets uniform. Three players in NBA history have barely approached the shitstorm that his three point shooting has been this season. That right side of the court has got me all smiles. 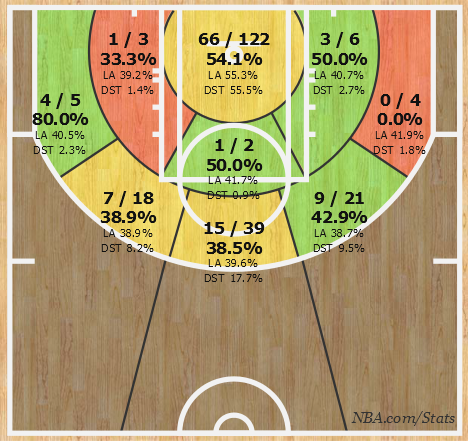 MKG has averaged 12.1 and 8.8 since the New Year, not to even mention his stellar as ever defense. Coach Clifford trusting him for 41 minutes against Chicago was an encouraging sign. Something that I might have had to include in the trade breakdown column but found to be too silly for it to be considered as a part of a more serious column. I won’t be too harsh on Gary and recognize him as a repeat Lolcat of the Week, yet this play deserves to be immortalized in YouTube’s archives. Neal’s last ever play for the franchise has him unnecessarily helping out on a drive and giving up a costly three (with us eventually losing the game and Zeller, obviously, not helping our cause as well). This blog’s edition features the first ever appearance by Marvin Williams. Marv’s body of work in fast-breaks has me pondering whether I would fear a nightmare of Tyrus Thomas repeatedly handling the ball in the transition more than Williams finishing one. Congratulations to Marvin! You’re now an honorary Lolcat. Al missed out on being this time’s Lolcat since I used the exact type of play to award him the honor last time around. I wish I was kidding. This entry was posted on February 27, 2015 by ReinisLacis in Charlotte Hornets blog and tagged Cody Zeller, Gary Neal, Jeff Taylor, Lance Stephenson, Marvin Williams, Michael Kidd-Gilchrist.